For most of my life I was never a fan of Valentine’s Day. It’s always over (or under) done, and involves way too much pink. 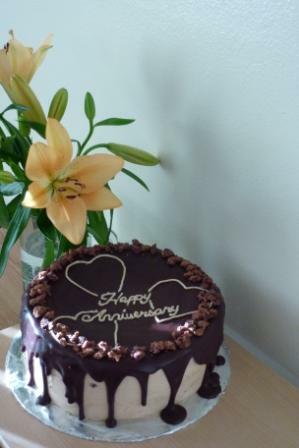 However, I no longer loathe the “holiday” because it happens to coincide with my anniversary with my boyfriend (henceforth known as M.) Last year I made a very delicious chocolate peanut butter cake from Smitten Kitchen. This cake was three layers of rich, delicious, chocolatey peanut butter flavor. But despite their amazing taste and texture, the cake layers were nearly impossible to work with. Even after being placed overnight in the freezer they were almost too crumbly to frost and layer. Whether this is just part of the recipe or due to my inexperience with cakes I don’t know, but it did inspire me to find a more manageable cake layer recipe. This time, I made sure to use a recipe that included pictures of the sliced cake to act as “proof” of manageability. I debated which accent flavor to involve, but another SK recipe convinced me to use a raspberry filling. 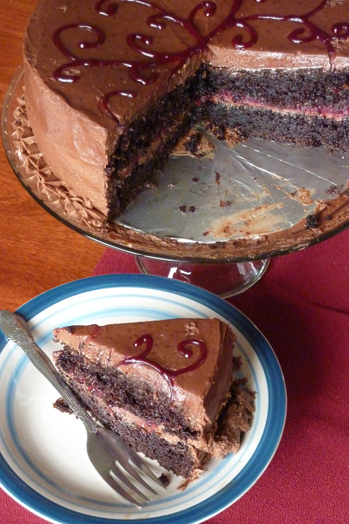 The result was a two-layer chocolate layer cake, chocolate buttercream frosting, and a raspberry filling. The layers popped easily from the pans, were easy to level, and held their shape nicely. Below you will find recipes for the cake layers, frosting, and filling. This cake is not difficult and would be an amazing addition to any celebration. Feel free to substitute any frozen berry you wish for the raspberries. In the bowl of your stand mixer (or a large bowl if you don’t have a stand mixer), combine the sugar, flour, cocoa(s), baking soda, baking powder and salt. Whisk (by hand) until well combined. Add the eggs, buttermilk, coffee, oil, and vanilla. With a stand mixer or electric beater, beat on medium speed for about two minutes, and pour into prepared pans. The batter will be quite thin. Bake for 25-30 minutes or until a wooden toothpick comes out clean. Cool for ten minutes in the pan, and then turn the cake layers onto a wire rack to cool completely. Freeze in Saran wrap or freezer paper for 2 hours (or a few days) until ready to frost. Add vanilla, salt and milk or cream and beat for 3 minutes on medium speed. As a note, my method for this is not the most time or dish efficient, but I did find it to be the easiest. Using a blender or food processor, puree the raspberries. In a small saucepan, heat the puree over medium heat until thin. Add sugar and cornstarch and heat over medium-high until it boils, stirring constantly. It should quickly thicken after reaching boiling temperature. Remove from heat and let cool completely before use. Fill a frosting bag fitted with a large star tip with chocolate frosting. Cut a cakeboard or piece of thick cardboard to the SAME size as your cake layers. (No need to leave extra room!) Cover with aluminum foil. Assemble a long serrated knife or cake level, a flexible cutting board (or similar item), a cake stand (or a plate), a straight or offset spatula (or a table knife), the remaining frosting, the filling, and your cake layers in front of you. Level your cake layers. (If it only dips slightly in the middle, this can be filled in with frosting if you prefer.) On a flexible cutting board place your cakeboard. Plop a couple of tablespoons of frosting in the center of your cakeboard, and press your first cake layer (cut side down) on top. Using a spatula, spread evenly with about ¼” frosting. Pipe a border of frosting around the edge to act as a barrier. Spoon or pour in the filling, being careful not to let it flow over the frosting barrier. Plop a second dollop of frosting onto a cake stand, and carefully slide on the cake/cakeboard. If necessary, clean the edge of your stand with a damp paper towel. Using the bag with the large star tip, pipe stars around the edge of the cake. If desired, transfer the remainder of the filling to a frosting bag fitted with a small, round writing tip (I think mine is a #3 Wilton), and use to decorate the top. This cake kept quite well for the rest of the week, at which point we had finished it off. Saran wrap works great, but be sure to wait until your frosting has set. If you are making this a day ahead (which I fully recommend, I thought the flavor was better on day 2), wrap with cling wrap (lightly over the cake but fully sealed around the stand or plate) and wait until the day you are serving it to pipe the decoration on top. 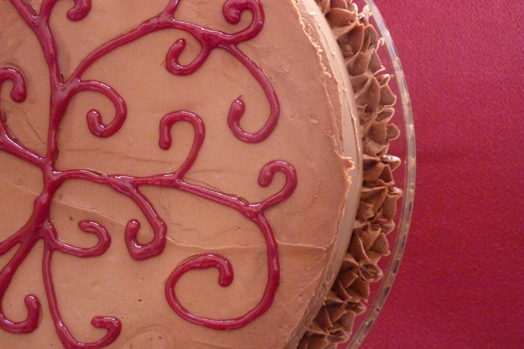 I used a toothpick to design my swirl design before I piped on the filling – much easier to make changes this way. The filling would also be great on ice cream!